and write your answer in the comments below. This is what we all want: 20,000 reviews on Amazon, mostly good. But even the author pictured here had to start somewhere. Getting reviews for your book takes time, effort, and lots of patience, but it'll help your visibility and sales. People hold varying opinions about the ethics of reviews. Paying for GOOD reviews is always unethical, while some argue that it's okay to pay for HONEST reviews, especially through big impersonal organizations like Kirkus. Whatever your opinion, here are some strategies for getting reviews without any money changing hands. -If you belong to a critique group, many of your fellow critiquers will be happy to review, as will some of your other author friends. To avoid potential awkwardness, make it an invitation instead of a request, and don't pressure or feel offended if they don't. Some people don't like mixing friendship and reviews. -In your e-book, be sure to add a call to action in the end matter, something like, "If you enjoyed this book, please leave a review on Amazon or your favorite book site, even if it's just a sentence or two telling what you liked. Thank you." A lot of readers don't realize how important this is, and might not think of reviewing, even if they loved your book. -Nicely ask for reviews from the fans on your e-mail list. -Reach out to bloggers who do reviews of books similar to yours. You can find lists of book blogs online, like on The Indie View (for Indie Books). You can also search for reviews of books in your genre. Bloggers often post their review policies and instructions about how to contact them. Most are pretty selective, but if your work looks right for their tastes, pitch them. -Blogtour.org is a free site where you can meet up with bloggers willing to do guest posts, excerpts, blurbs, interviews, etc for blog tours. Some also do reviews. -Participate actively in Goodreads groups. Many have sections where you can offer free books in exchange for reviews or participate in review circles and read-to-review groups. Be sure to advertise in the appropriate section, and only after you've contributed to the group by commenting on other posts. -If you have a paperback version, do a Goodreads giveaway. People enter to win a copy and then you mail it to them. Winners of these competitions tend to review more often than random readers, especially if you mention that reviews are appreciated. Giveaways also get your book added to members' "to read" lists, which may eventually lead to sales and reviews. In your description for the giveaway, put eye-catchers first, like short quotes from reviewers or "FREE AUTOGRAPHED COPY." -You can also run giveaways of e-books at places like LibraryThing. -The most effective way to get good reviews, according to Jim Kukral of AuthorMarketing, is to find people on Amazon who have positively reviewed books similar to yours. Check their profile pages. If they've listed their e-mail address, you can contact them. Send a nice personalized e-mail telling them that you saw their review on such and such book, and that you've written a similar book. Ask if you could provide them a free copy in the hopes that they'd consider reading and reviewing it too. Be sure to emphasize that if they take it, they can choose not to review it, and if they review it, they're under no obligation to give a positive review. Thank them. This takes a lot of work, since you have to find reviewers that are still active and have listed their contact information, but you're more likely to reach people who will like your work and possibly become long-term fans. -Work on getting your book out there, using the promotional strategies on this blog and any others you've learned or imagined. The more readers you have, the more reviews you'll get. When is the best time to start looking for reviews? Before your book launches. Can you still work at it long after the book is published? Of course. Keep plugging away. All these strategies take time, and only a fraction of the people you contact will actually end up posting a review, but every review helps—even the not-so-positive ones. And as always, keep writing! Good timing, as I have a book coming out in a month! Thank you for the suggestions and links. Great post Melinda, and I totally agree that paying for reviews is not only unethical, it's counter-productive. A solid query also helps so spending a bit of time getting that pulled together is really important. Also learning to ask for it. If someone says to you - "I loved your book" - just ask them to put up a brief review on Amazon. Also bear in mind that not all reviews will be good, no matter how good the book is- that's just part of the deal, especially with free days because you'll reach people way outside of your target market. Heidi, glad this could help. Magda, good point about asking outright for a review from people who say they loved it. I always have to steel myself to do things like that, but it's important. Melinda, great tips on getting book reviews. Adding a CTA at the back of the book is a great strategy to motivate readers to post reviews. Great tips Melinda. I think it's also important to remember to write reviews of books you enjoy... I consider this paying it forward. First time I've read anything on this topic. So interesting! Thanks, Melinda. Now. What's the mystery book? I have no clue. Here's a hint about the mystery book: It's a popular YA book. The last review quote says, "Great job Suz..."
Melinda, this post is a great help, thanks. It's a keeper. A local author recently released his book with a big splash, book signing, etc. and a Kirkus Review. It was a learning experience for me because another author friend told me he paid quite a sum for that and people know it. What I took from that is that readers may not take paid reviews seriously. 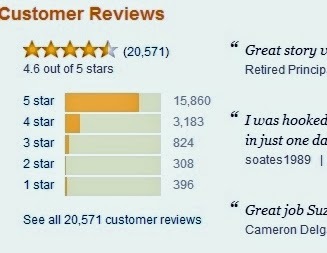 So your tips for true reviews are invaluable. Thanks! Kathleen--The mystery book from the picture is The Hunger Games.